← Where does summer go? It’s been a while since I blogged about the CSA. It’s been incredibly hot here in Wisconsin this July, making me not want to cook in my un-air-conditioned kitchen. With that, plus the fact that I’m on the half share and not getting nearly as many vegetables and making a lot of repeat dishes, my kitchen has been boring. I had a ton of cauliflower and two boxes of tomatoes, both of which have already gone to good use in Cauliflower and Parmesan Cake and Tomato and Corn Pie. These two dishes (from Smitten Kitchen) are two of my absolute favorites, but both taste best in season–especially the Tomato Pie. In fact, last year, I tried to make it with store-bought tomatoes after tomato season ended, and it just didn’t have the same oomph that makes it so wonderful during the season. Both those dishes used a healthy dose of basil, but even after I gave away bunches to coworkers, my carpool buddy, and even my landlord, I still had 10 giant bunches of basil left. What to do? I froze it. It’s super-easy to freeze basil. I rinsed it thorough in a colander, spun it in my salad spinner to remove the water, and laid it on a dish towel in a single layer. Then I rolled up the dish towel to gently wring out the last of the water, unrolled it, and put the basil in a freezer bag in a single layer. I sucked all the air out the bag with a straw, and threw it in the freezer. 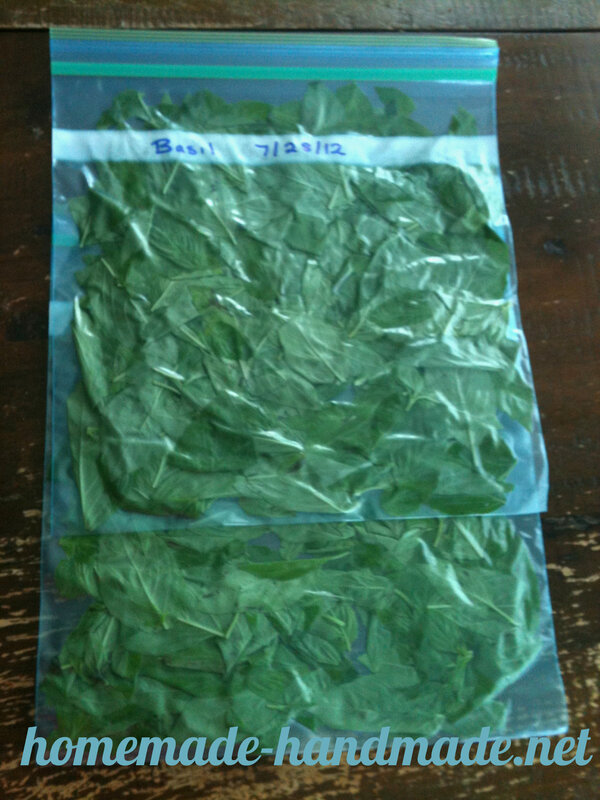 The basil won’t have the same leafy texture that fresh basil has, but it has a bit more flavor and body than dried basil, so it works great for cooking. Come and add your link to this week’s CSA Link party. http://inherchucks.com/2012/07/25/whats-in-the-box-36/. Hope to see you there!